Since 1988, I have been using recycled materials. An overarching goal is to remove materials from the waste stream and bring awareness to the excessive waste of our consumer society. This was before curb site recycling or the current popularity for artwork from recycled materials. My work is entirely based on the use of post-consumer material diverted from a destiny as trash. This focus on re-using discarded materials addresses a spectrum of social, political and environmental issues. All my artwork uses only use post-consumer materials. I have acquired an extensive inventory of post-consumer tin cans and plastic containers. My B.F.A. and M.F.A. plus 40 years of metalsmithing experience have developed skills to make works with superior craftsmanship while presenting multi-layered, thought-provoking content. 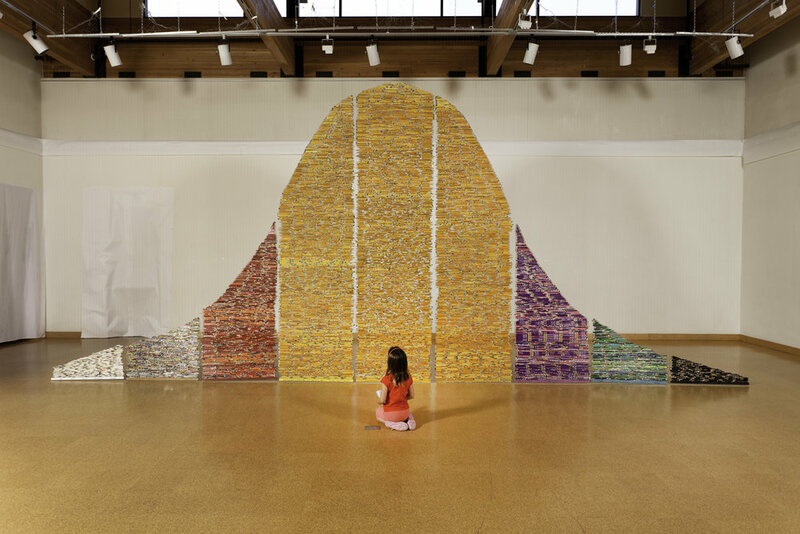 “Pick Up Your Pencils, Begin” used secondhand pencils for a 28-foot bell curve installation about standardized tests. More recently, a 26 foot Black Plastic Gyre necklace made of plastic waste highlights the environmental consequences of plastics accumulating in our oceans. The content issues often dictate the choice of recycled materials. I focus on exhibition and museum quality work typically spending months to several years on one piece. Everything is one-of-kind.